What, you weren’t invited to the Fenway Park bash for Rhode Island’s Democratic Congressman James Langevin on August 25? It must have been a mistake, or it got lost in the mail, right? Or maybe not, if you don’t have [or wouldn’t want to give] the minimum $1,500 campaign contribution that would have bought you a seat. But, at least, now you know about it. And you can find out about lots and lots of other similar events at Party Time, which documents the political party circuit, one invitation at a time. From the early hours of the morning until late in the evening, politicians are partying. Party Time can help you find out who is partying, where and when. 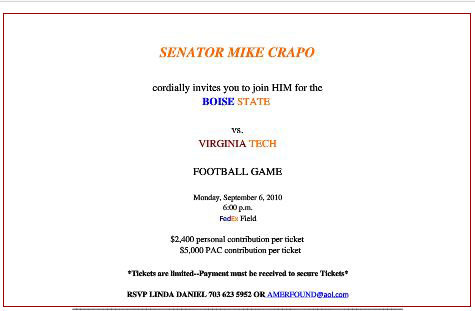 re the price of admission to the party, for an individual, is a donation of $2,400. What’s the point? Party Time gives outsiders an insider’s look at the way money flows in political campaigns. You can view the array of invitations that go out by the dozens over fax lines and emails and through snail mail to lobbyists, Political Action Committee [PAC] representatives and others around Washington, DC and beyond,” explains Nancy Watzman, Party Time’s director. You can see who is hosting these parties, how much money it costs to go, where and when the party is and what people are going to be doing there. These invitations provide a treasure trove of information for citizen journalists, activists and others who are interested in following how money flows to congressional candidates. You can use these as starting points to connect dots of the relationships between lobbyists, congressional candidates, issues being lobbied and campaign money received. You can also add to our party wealth by sending along any invitations you have come across, or commenting on a particular fundraising event. Now, how can you wangle an invite to that Redskins vs. Cowboys game on Sept. 12, benefiting Rep. John Larson [D-CT]? Easy. Get out your checkbook and put a couple of zeros after the numbers 2 and 5. Previous Post:Mr. Oilman, tear down this rig!